Montpelier officials and energy advocates today announced that the City is now poised to get the majority of its electricity from renewable energy sources with the completion of a 500 kW solar photovoltaic array located on an old gravel pit behind Log Road in Montpelier. A second array in Sharon was completed last year. 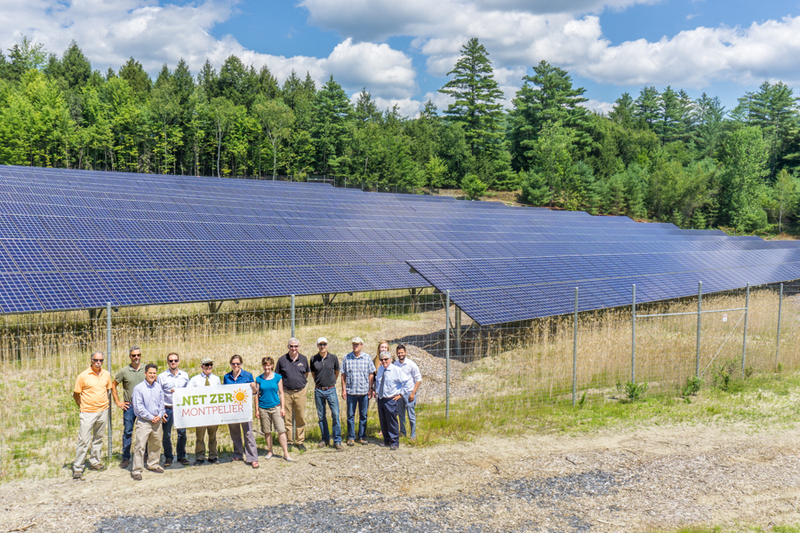 “The Montpelier Energy Advisory Committee is very excited to see the results of many years of hard work to bring these solar arrays online for the City,” said Kate Stephenson, MEAC Chair. Stephenson, City Manager Bill Fraser, array owners Kendall Sustainable Infrastructure, and members of MEAC met at the site to highlight the achievement. “The City's commitment to invest in 1 megawatt of solar capacity was a significant step towards reaching our goal of being a Net Zero city by 2030, and this project will save money for the City for the next 20+ years,” Stephenson said. A review of municipal energy use found that in Fiscal Year 2017 (July 2016 thru June 2017) the total municipal electricity use was 2.5 million kilowatt hours (kWh). In that same period of time, the new solar arrays produced 788,710 kWh, offsetting 31 percent of the total. This was only a partial year because one array came online in August and the other in December. In FY17, MEAC anticipates that the renewable energy produced by the solar projects will offset 55 percent of the city’s annual municipal electricity consumption. Partnering with Novus Energy Development, a Montpelier-based firm specializing in the development of solar powered projects, the city government entered into a Power Purchase Agreement for municipal electrical use. The City of Montpelier and the School District expect to save $40,000-$50,000 a year for the first 10 years of the contract. In the future, the City will have the option to purchase the solar arrays outright at a fair market rate. Electricity produced by the solar panels is credited to municipal buildings within the City of Montpelier, including the Water Resource Recovery Facility, City Hall, the Fire Station and Police Station. The innovative Power Purchase Agreement allows the City to invest in renewable energy with no upfront cost, and see savings on its electric bill from Day 1. Part of a multi-year effort to increase energy efficiency and reduce the use of fossil fuels, these solar projects will help the city achieve its 2030 goal to become the first Net Zero state capital in the United States.